Pope Francis: demilitarize our hearts to enter together into the ark of fraternity. The strategy of dialogue. The document signed by the Holy Father and Ahmad Al-Tayyib, Grand Imam of Al-Azhar. «I am happy the Lord has given me this opportunity to write a new page in the history of relations between religions in your beloved land». This is how Pope Francis described, last Thursday, what was about to happen in the United Arab Emirates. And it did happen. Today, in Abu Dhabi, a page in history was truly written. 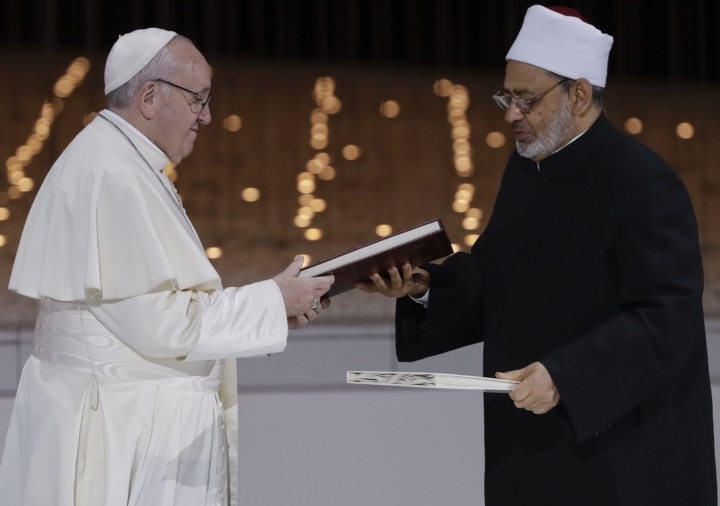 ‘Fraternity’ has officially become a reference for universal peace and living together, as the title of the final document, signed by the pontiff and the Grand Imam of Al-Azhar, Ahmad Al-Tayyib, states. Undoubtedly, it is a religious document, signed by two personalities from very different cultural and religious contexts who are, in equally different albeit significant ways, points of reference for billions of believers. But the document has an even greater value, also for the potential international impact of this event, which was captured by the cameras of all major global broadcasters and was relayed live to every corner of the Earth. In that strip of land, called the Emirates, in the Arabian Peninsula, undisputed symbol of Islam, something happened that has changed the world. Undoubtedly, tensions will continue and, unfortunately, wars too and, perhaps, violence in the name of religions. But what we have seen and heard debunks the myth of the clash of civilizations. Just picture the three men – the Crown Prince, Sheikh Mohammed Bin Zayed al Nahyan, who welcomed the two religious leaders, the Pope and Imam Al-Tayyib – walking hand in hand on the platform leading to the massive Founder’s Memorial, which yesterday hosted the great interreligious event with leaders of different traditions from every corner of the world. This scene is bound to become part of our common imagery and an icon of the concrete possibility of fraternity. And then, let us recall the words of the two men of faith. Imam Al-Tayyib took the floor and on several occasions addressed his ‘friend’ and ‘brother’, Pope Francis. The two leaders are meeting in these days for the fifth time, but they have been working together for the same purposes and towards the same goals for some time: to lead the followers of their religions to the recognition that all men and women are brothers and sisters. As a matter of fact, fraternity is a fundamental principle for us to live our faith, recognizing and appreciating the faith of others and working for peace in the world. Al-Tayyib unequivocally stated that religious leaders who believe in violence have read their respective sacred texts in a false and erroneous way, because God does not invite us to kill or even just terrorize those who hold different beliefs. The Imam of Al-Azhar revealed that the document that was about to be signed was born from an idea that emerged around a table and that reflected Bergoglio and Al-Tayyib’s shared views on the value of fraternity. The Sunni leader also encouraged Muslims in the West to become integrated in the societies where they live and realize that the security of those countries is also their responsibility. Words were also addressed to young people, urging them to use this declaration to build their future by raising barriers against hatred and teaching their children the true values of peace. Bergoglio, on his part, referred to the image of the logo of his visit to the Emirates: the dove with the olive branch, which recalls the primordial event of the flood that is present in many religious traditions. God asked Noah to preserve humanity by entering the ark. Today, Pope Francis urged those who were present to enter together into the ‘ark of fraternity’. We must always remember that, faced with the truth that God is the Father of all men and women, «religious behavior needs continually to be purified from the recurrent temptation to judge others as enemies and adversaries». True religiosity means loving God with all our hearts and our neighbor as ourselves, the Pope insisted. Being brothers and sisters, however, does not mean uniformity. Fraternity «also embraces the variety and difference between brothers and sisters». Therefore, religious plurality is a reality that cannot and must not leave room for any kind of syncretism. As a matter of fact, the founding premise of fraternity is the awareness of our own identity and, at the same time, the courage of otherness, defined as the ‘heart of dialogue‘, based on ‘sincerity of intentions‘. Pope Francis had already stressed the importance of these concepts during his trip to Egypt at the Great Mosque of Al-Azhar in Cairo. And, reiterating the same principles, Bergoglio highlighted how this “involves the full recognition of others and their freedom“, their religious freedom more specifically. He also referred to the importance of prayer, which has the power to purify the heart from turning in on itself and recast it in the certainty of fraternity. Pope Francis has no doubt: «as to the future of interreligious dialogue, the first thing we need to do is pray. And pray for one another: we are brothers and sisters! [who are called] to adhere fully to the will of God, who wants all men and women to recognize they are brothers and sisters and live as such, forming the great human family in the harmony of diversity». For the future, Bergoglio sees no alternative: «either we build the future together or there’s no future”. And, here, the role of religions and believers is essential in building bridges between peoples and cultures. It is an invitation for religions «to more actively exert themselves, with courage and audacity, and without pretense, to help the human family deepen the capacity for reconciliation, the vision of hope and the concrete paths of peace». But Bergoglio did not stop there. The speech outlined a true strategy of dialogue as the way to lasting fraternity for peace. And, in this sense, other elements are needed: namely, education and justice. For true and authentic educational processes, reciprocity is necessary, the Pope insisted. «Education also takes place in relationship, in reciprocity. Alongside the famous ancient maxim “know yourself”, we must uphold “know your brother or sister”: their history, their culture and their faith, because there is no genuine self-knowledge without the other». A real identity is open and consciously overcomes the temptation to turn in on itself. But justice too is a decisive factor: it is the second wing of peace. «No one can believe in God and not seek to live in justice with everyone». The founding character that unites religions and cultural traditions is the golden rule: «So whatever you wish that men would do to you, do so to them; for this is the law and the prophets». Inspired by the region that welcomed him, without forgetting the contradictions that characterize it and the tragedy of neighboring Yemen, that continues to cause victims especially among children, Begoglio urged everyone to work together to ‘demilitarize the human heart’ and embrace «a message of trust, an encouragement to all people of good will, so that they may not surrender to the floods of violence and the desertification of altruism». The signature of the “Document on Human fraternity for World Peace and Living Together”, is an icon that shows us that this is possible, even in the face of a narrative that is forcing us to believe the opposite.